And by winter, of course I mean, Christmas! I know it’s a little bit early to be thinking about Christmas, for most of us anyway, but when it comes to ordering online, I suppose September is not so crazy early after all. 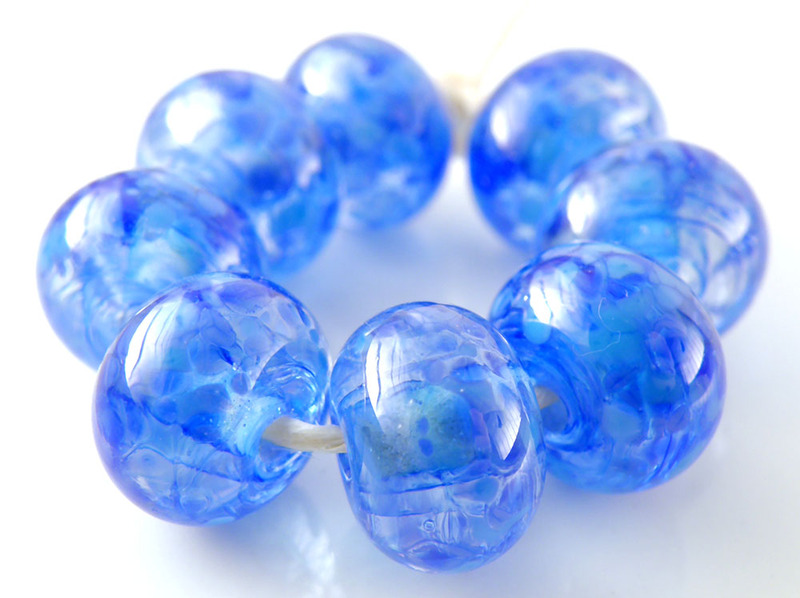 On that note, I probably should be thinking about making some Christmas themed beads. In the mean time, my dad has opened an Etsy shop recently. 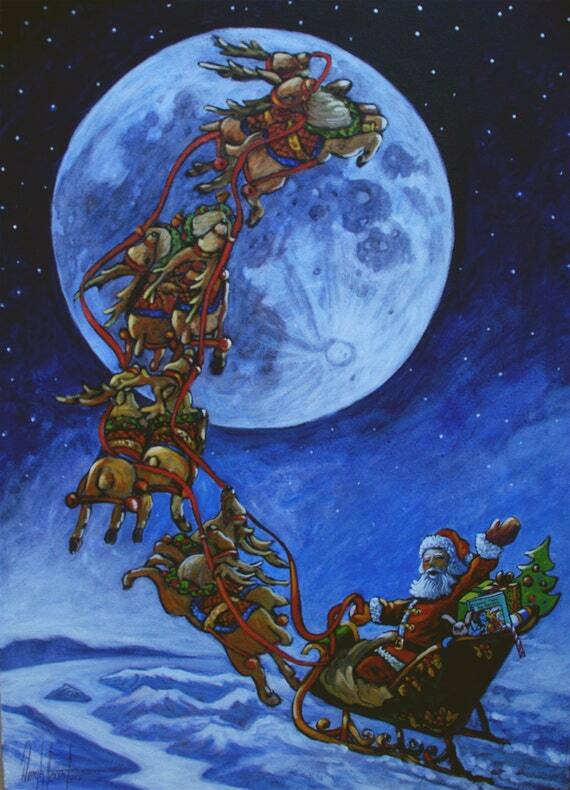 It’s featuring a select few of his original paintings, along with Gicli reproductions, art cards, and digital downloads (if you want to use his images for yourself). Of course I am a huge fan of my dad’s art because I’m his daughter. 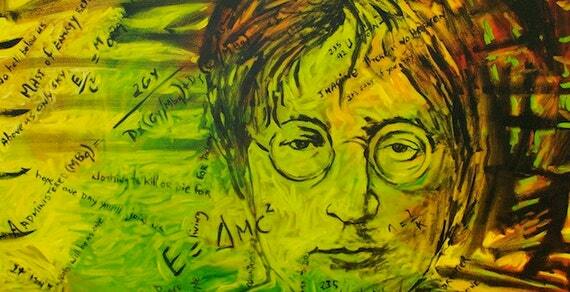 He has been working on a series lately featuring The Beatles (yes, that is John Lennon, not Harry Potter, in the image above). And while we are on the subject of family members on Etsy, my mom has also opened a shop recently. She is de-stashing some seriously cool and unique vintage stuff – stamps and other paper ephemera, loads of vintage glass items, and other odds and ends. Also very much worth checking out. So what am I up to these days as the summer slips away into Autumn? Well, I am still working on school. Still working at my day job. A lot has been going on in my life so I haven’t been as active online as I was previously, but I am still very much working on glass as well. 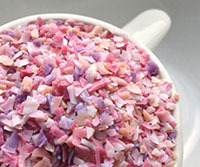 I am currently testing some new blends for Val Cox Frit, which I will be talking about more in the very near future I am sure. And with that I will sign out – hope everyone is having a great start to the school year! 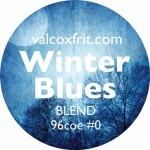 This isn’t a new Val Cox blend, but she is now offering it in #0 size (which I think is fairly new!) – anyhow, here are some of my results from testing yet another lovely Val Cox blend. Loving these small grinds that are now available! 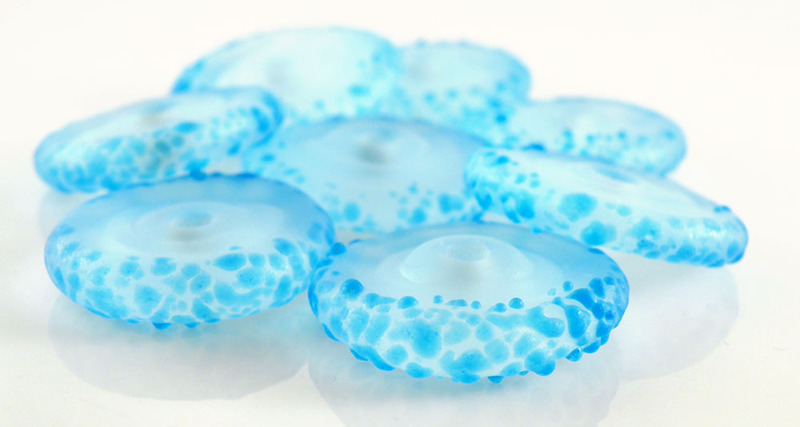 This frit (sold by Val Cox) is a “lovely blend of three cool blue opaques.” This frit was very easy to work with, encased beautifully, etched beautifully too, and created some very pretty reactions when combined with silver foil. It made me think more of ocean blues than winter, personally, although I suppose it has a bit of a “minty” feel to it as well. Very fresh! 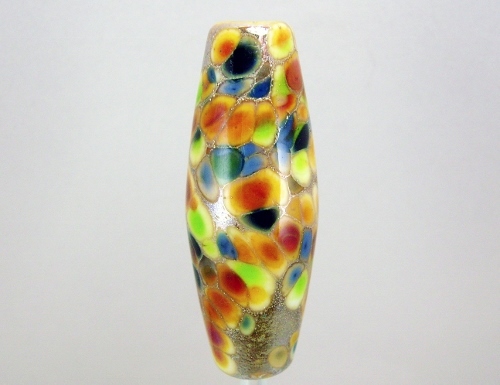 Val Cox Winter Blues frit (#0 size) encased in Reichenbach R100 clear. Val Cox Winter Blues frit (#0 size) with silver foil encased in Reichenbach R100 clear. 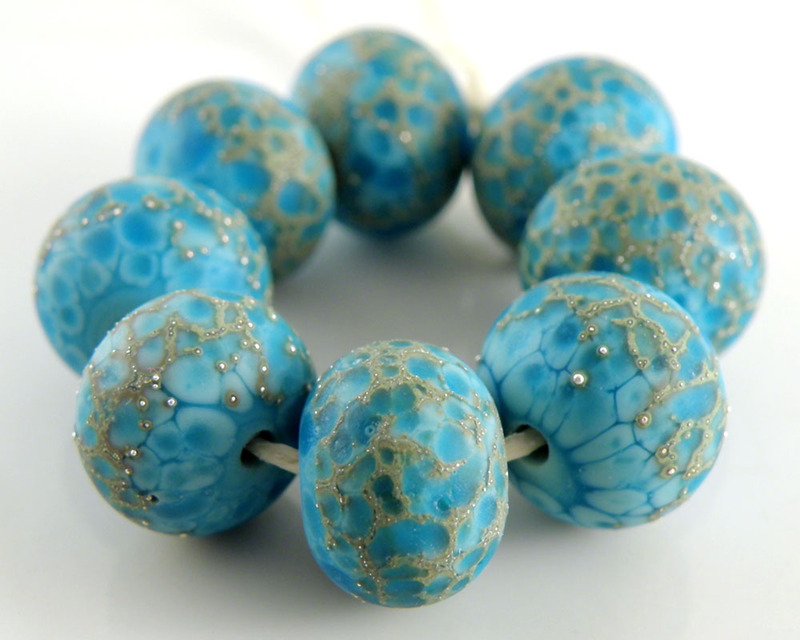 Val Cox Winter Blues frit (#0 size) on a base of Moretti 232 Pastel Light Turquoise, with silver foil, etched. Val Cox Winter Blues frit (#0 size) on a base of Moretti 224 Pastel Light Sky Blue. Val Cox Winter Blues frit (#0 size) on a base of Moretti 219 Pastel Copper Green. Core is Moretti 060 Transparent Cobalt Blue. Val Cox Winter Blues frit (#0 size) on a base of Moretti 038 Transparent Very Pale Aquamarine. Val Cox Winter Blues frit (#0 size) swirled in and speckled on Moretti 004 Transparent Clear. This week I have been experimenting with glass etching. 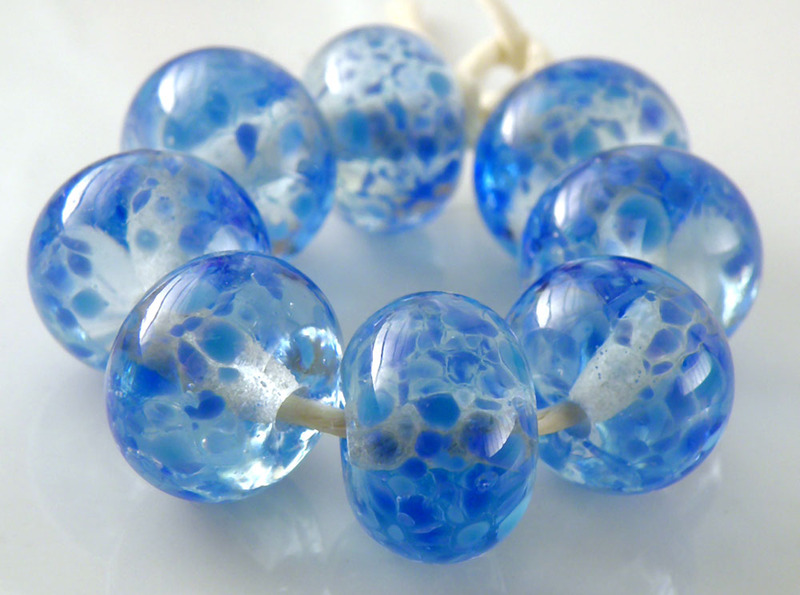 This is a technique that is widely used with lampwork beads, but one that I have only really touched on slightly in my own work. I don’t have a good reason for this. 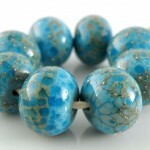 I love the way etched beads look and the way etching a bead can so subtly or even drastically alter the way it looks. There are a few ways to etch glass. 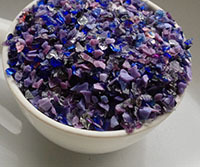 I think the two most popular are chemically etching with an acid, and mechanically etching, for example in a rock tumbler or with a sand blaster. 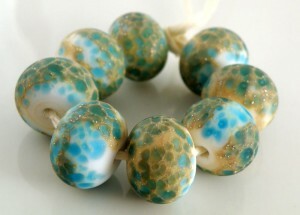 I have tumbled beads in the past but I personally prefer the acid etch method. I use Etchall Dip n Etch myself – a liquid acid product that is convenient to use because you can dip the beads right into it. 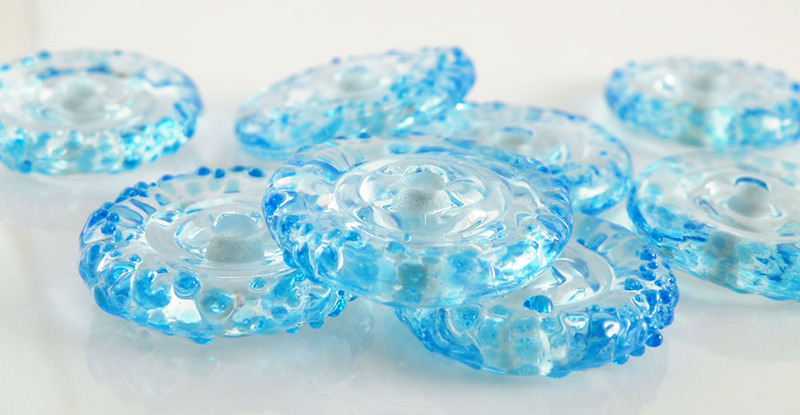 I use a few safety precautions with it – I wear gloves, and when I remove the beads from the etching solution, after rinsing the beads well, I soak them in a plastic bowl of water and swirl some baking soda in to neutralize any remaining acid. Then I rinse them again very thoroughly and dry them out. Make sure you have proper ventilation as well, and access to a timer. I found some instructions on the acid etching method here that pretty much describes my method perfectly. 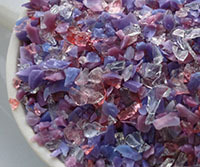 Here is some info on an alternate method of etching – tumbling beads to etch in a rock tumbler. I will also add my usual reminder to look for “SRA” on Etsy/eBay/etc. 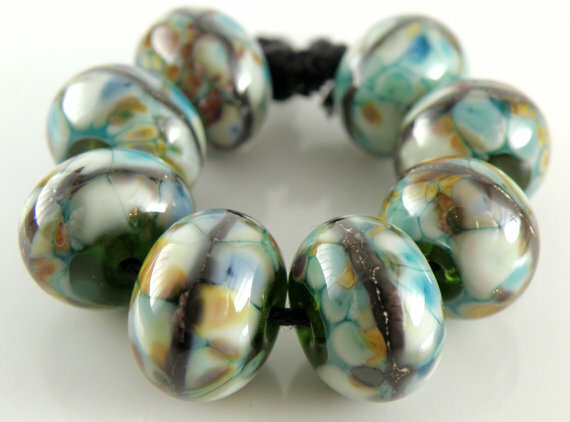 This means the artist is a “Self Representing Artist” – they create their beads one by one, by hand. (Note that not EVERY self representing artist uses the “SRA” designation but the number is growing! For more information, visit the SRA website. The artists featured here are all Self Representing Artists (whether they are members of the official SRA or not). 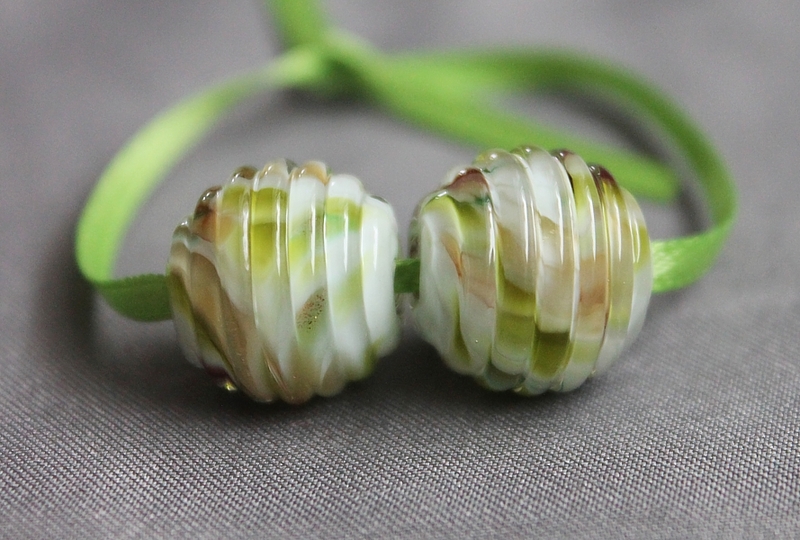 Please support these wonderful lampwork glass beadmakers! And now, on to the artists. 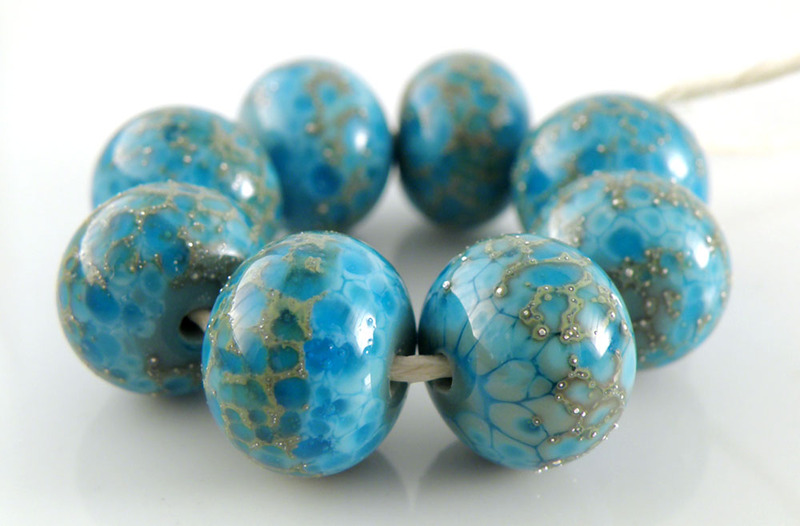 “Simply Da Blues” by Debbie Altman of All My Beads. 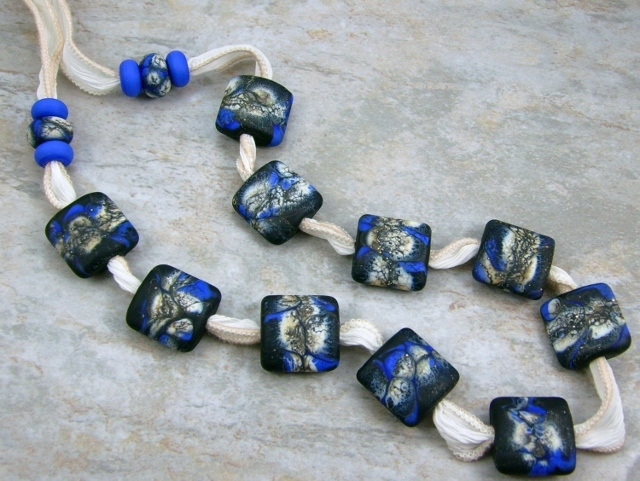 Black base, dots of cobalt blue, silvered ivory stringer added then swirled. Etched after cleaning. “Siren’s Call” by Amy Hall of Two Glassy Ladies. 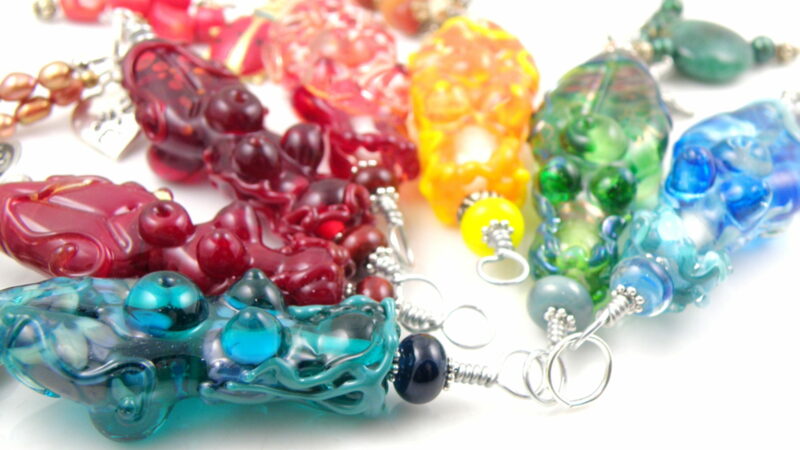 This week for my “Friday Feature” here on the Two Glassy Ladies blog, the theme is Frit Beads. I will also add my usual reminder to look for “SRA” on Etsy/eBay/etc. 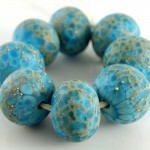 This means the artist is a “Self Representing Artist” – they create their beads one by one, by hand. (Note that not EVERY self representing artist uses the “SRA” designation but the number is growing! For more information, visit the SRA website. The artists featured here are all Self Representing Artists (whether they are members of the official SRA or not). 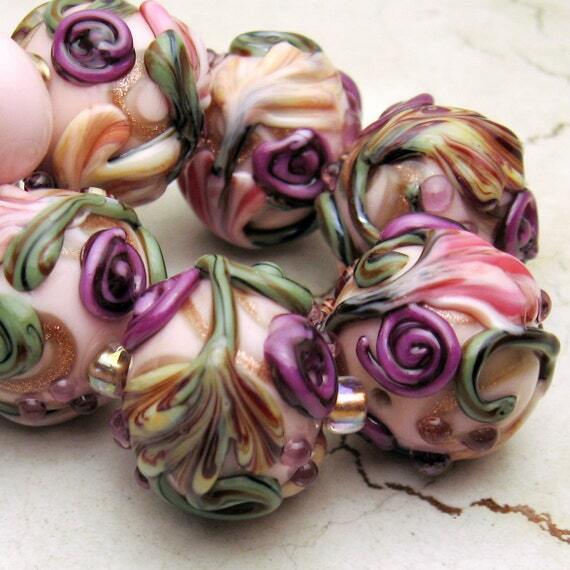 Please support these wonderful lampwork glass beadmakers! White base, Utopia frit blend from Glass Diversion and encased in Effetre Super Clear. 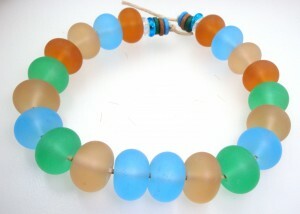 The bead was shaped using CGbeadroller ribbed round. 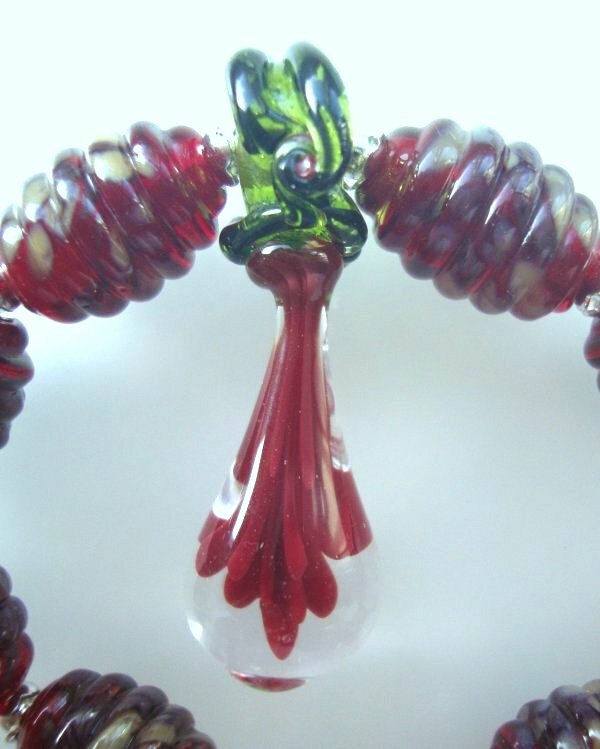 Dropper pendant and ribbed frit barrels by Debbie Dew. Made with 104 CoE glass, the dropper has been made by imploding opaque red frit and the barrels are Effetre striking red with Beady Sam big waves frit. 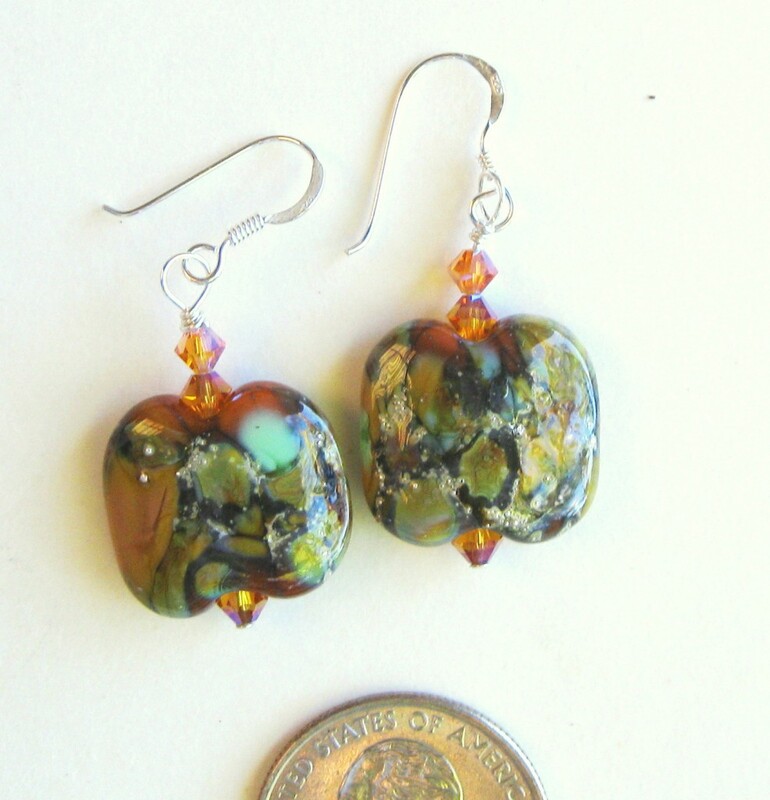 Dangly Lampwork Pillow Frit Earrings by Maren Purves. Available on Etsy. “Into the Woods” – Val Cox Dream Cream frit swirled in Moretti 004 clear, with Moretti 016 Dark Topaz and some other ambers in there as well. More Drama Cream speckled on the surface. By Amy Hall of Two Glassy Ladies. Available on Etsy. “Morning Tree” by Tina Beachy of Silver Reflections. 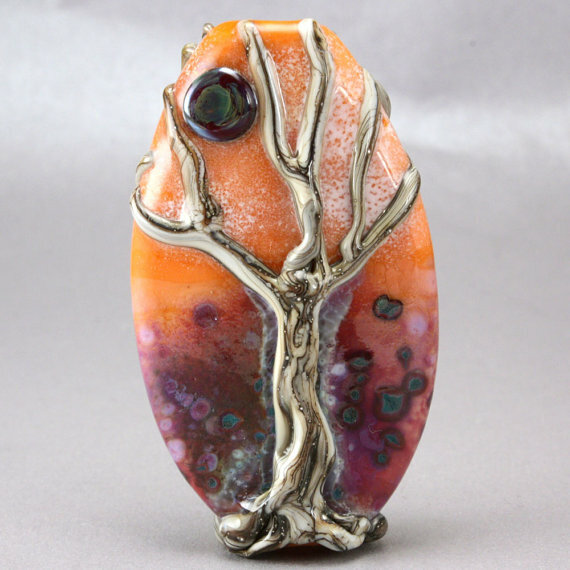 A sun shiney tree bead with a base of orange creamsicle and white enamel plus a frit mixture with z99. 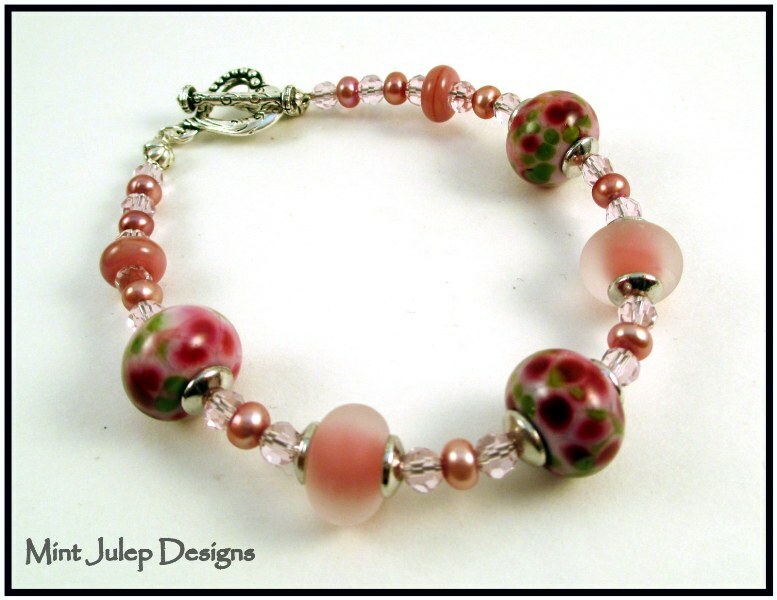 “Pretty in Pink” by Vicki Gentry of Mint Julep Designs. This bracelet features 7 lampwork beads with the frit beads being made with Bead Goodies “Innocence” frit on a base of Effetre Dark Pink. 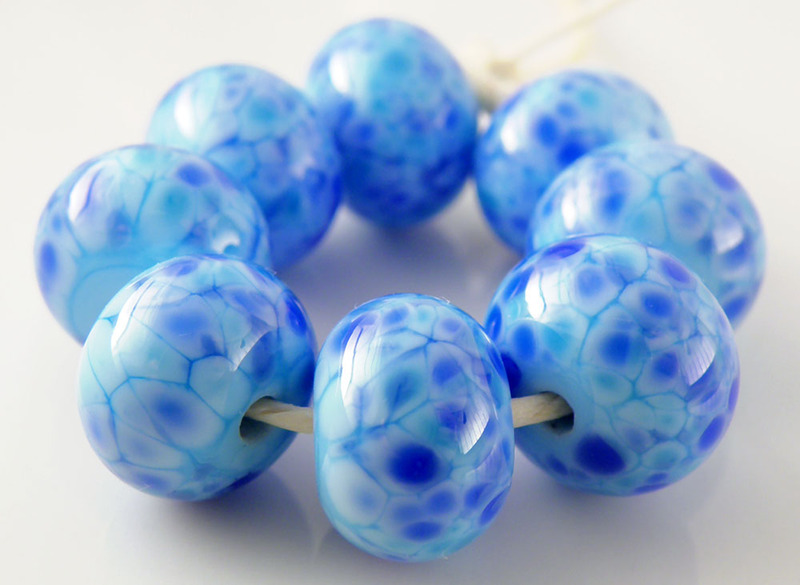 This is not an original combo, but it does make for a pretty bead! 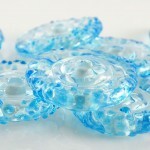 The etched beads are a core of Effetre dark pink, encased with Effetre Super Clear and etched. 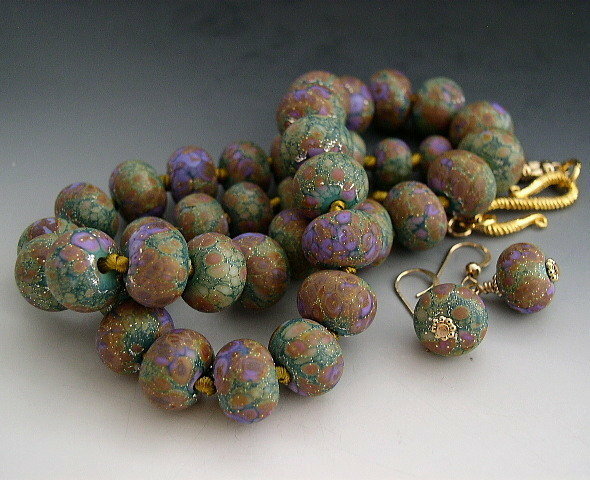 The small spacer beads are Reichenbach raspberry opal. Pink crystals and pink freshwater pearls complete the piece. It has a toggle closure and measures 7 ½ inches. 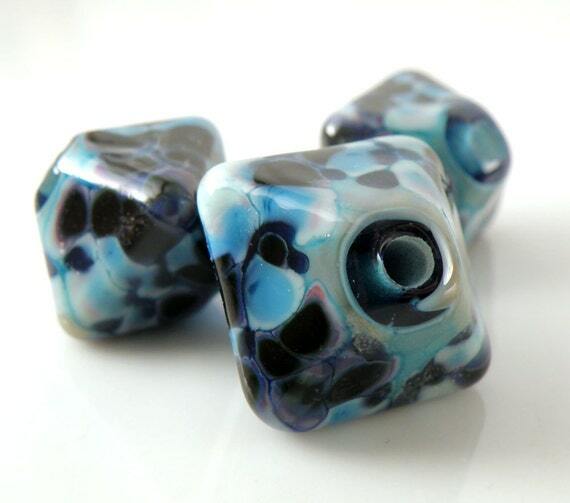 Win a set of my lampwork beads! 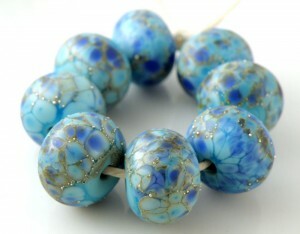 “Like” Two Glassy Ladies on Facebook for a chance to win this bead set! I will randomly pick a winner from my Facebook fans next Friday (April 26th) at 5:30pm PST. And please share this post! 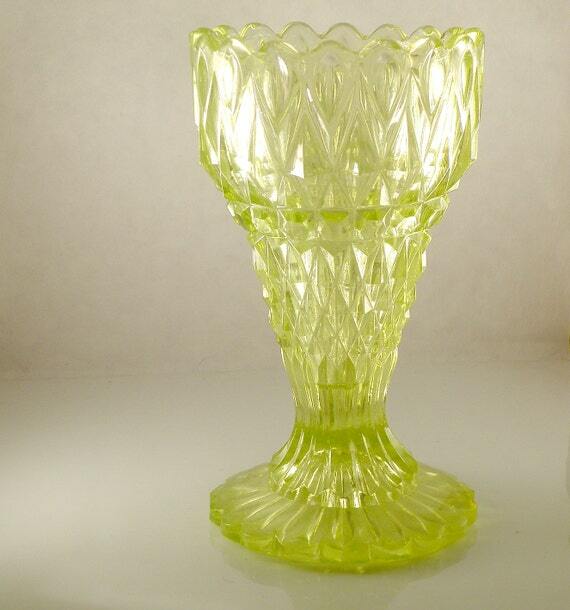 This is the first of (hopefully) many “Friday Features” here on the Two Glassy Ladies blog. 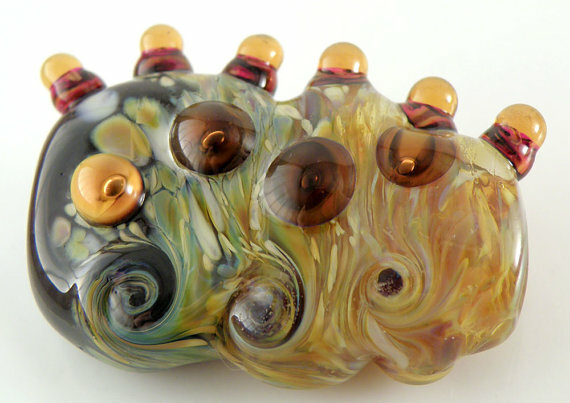 I want to use this little bit of time/webspace to feature the work of some wonderful and talented glass artists. Most of these people are friends I have made through the “Lampwork Etc” webforum. 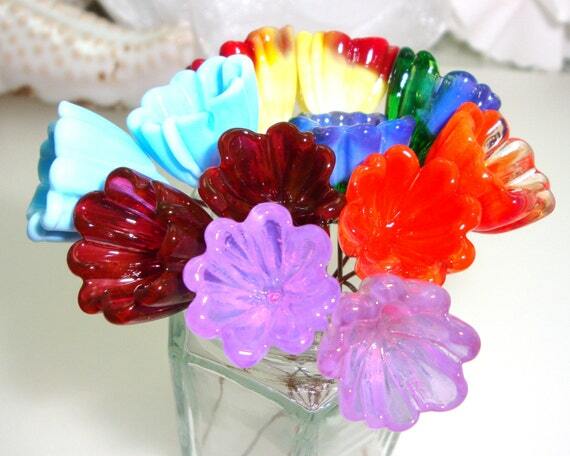 It is really important for us glass artists to promote one another, because the competition out there as artists has become more and more of a challenge – not so much because we as artists are competing with one another, but because we are competing with mass-produced glass beads. I’ve talked about this before so I won’t go on another big rant now. But I will put out the reminder to look for “SRA” on Etsy/eBay/etc. 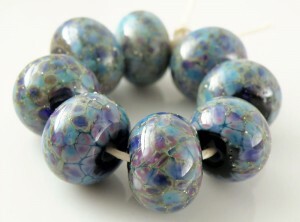 This means the artist is a “Self Representing Artist” – they create their beads one by one, by hand. (Note that not EVERY self representing artist uses the “SRA” designation but the number is growing! For more information, visit the SRA website. 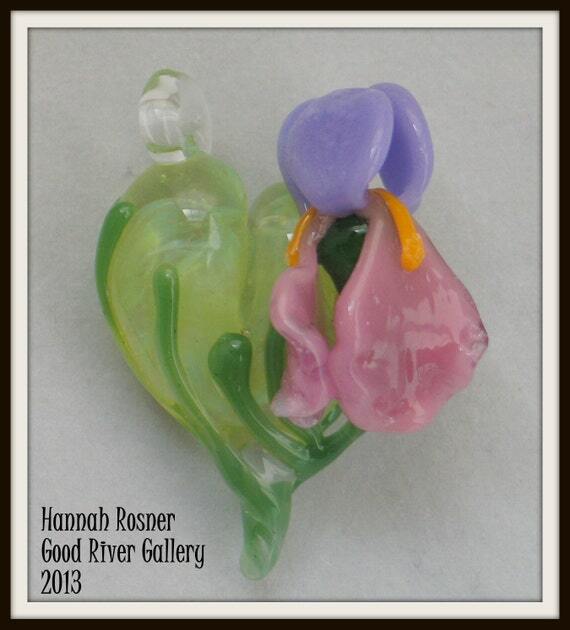 “Spring Iris” by Hannah Rosner. Available on Etsy. “Spring Buds” by Rosebud. Available on Etsy. “Pincel de Fuego” by Gabriela Arosemena. “This is a pair of earrings with flower allusive murrini.” Available on Etsy. “Goddess of Water Sprites” by Amy Hall of the Two Glassy Ladies (me!). Available on Etsy. 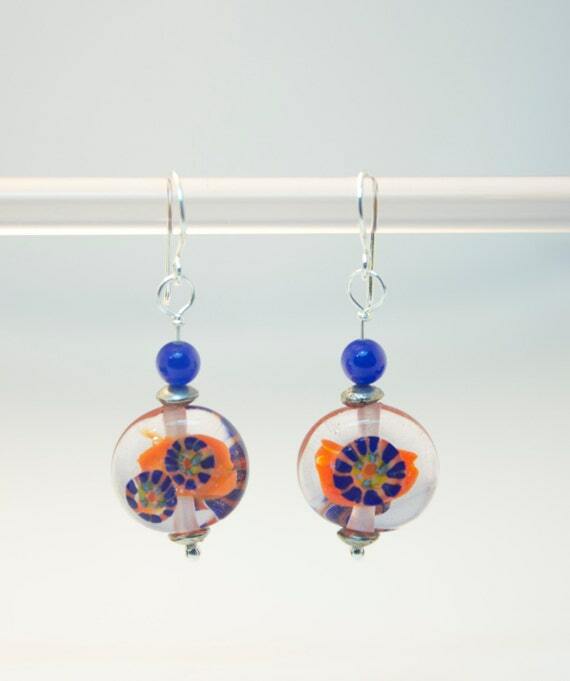 Raised Florals by Sheila D. Available on Etsy. 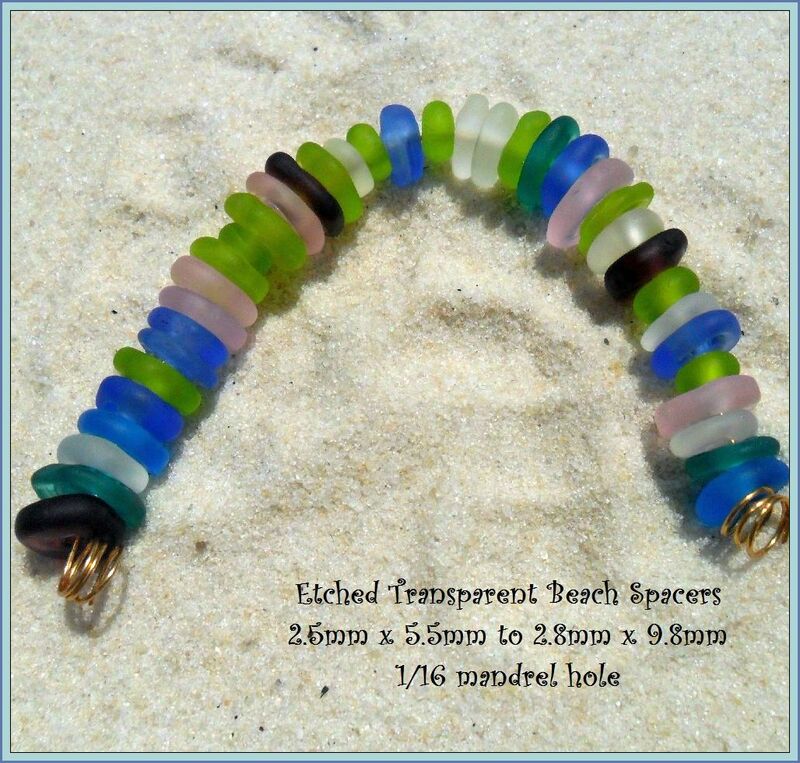 Bellflowers by Elizabethbeads. Available on Etsy. Wasabi Birds by Tina Beachy. Available on Etsy.